It's a terrible feeling when no one shows up to Campaigners. Trust me, I know the frustration all too well. Below are 4 things that I've seen build tons of momentum in Campaigner groups over the years. 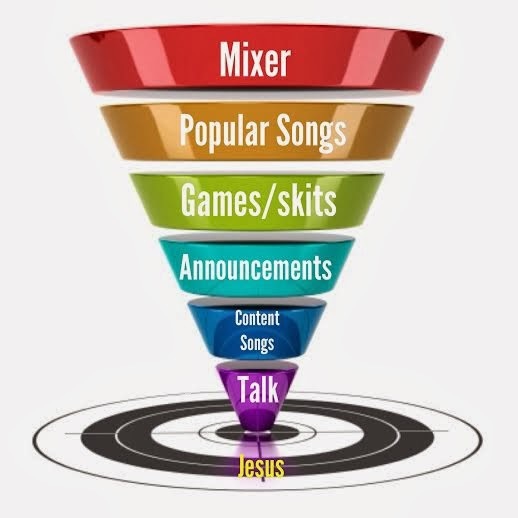 At club, we intentionally funnel the focus of the night from the crazy mixers and Bieber songs down to content songs and the talk, all to point to Jesus. If we started club with the talk, it wouldn't flow as well. Even our talk sequence is funneled. Campaigners works best when using that same approach. I have Campaigners on Sunday nights. In January, there are big football games every Sunday night. Instead of making guys choose to watch the game or to study the Bible, I use the first few weeks back after Christmas to just get guys in the habit of getting together again. We've watched football the past 3 Sunday nights. This past week, we had a short Bible study during half-time. This weekend we're going snowboarding and the following week we'll have a Super Bowl party. By February guys will be used to carving out Sunday nights to be together. We'll start back with typical Campaigners structure and a longer time of prayer, studying God's word, and talking about life, love, and other mysteries. Only half of the guys in my Campaigners group actually like football, so I make sure we have good food, video games, ping pong, and other things guys who don't like football can do while we're hanging out. It builds confidence when you learn to swim in the shallow end before jumping off the high dive. Instead of Panera or the YL office, I'm a big fan of having Campaigners at a kid's house. We used to do club in a different house every week but now we meet in a church. When we were having club in homes, it gave me better opportunities to get to know parents, see kid's rooms, and just get to know them better. Since we moved club out of homes, there are tons of kids I know well whose parents I've never met and homes I've never visited. Not every kid in your group has a home that would be good for Campaigners to meet in, but don't let that stop you. You want to have a space in the home that's private enough for kids to feel safe to talk, but garages and back yards can work in smaller houses. If you have 10 kids that typically come to Campaigners, pick your best 5 houses and ask those 5 parents if they would be willing to host 2 Campaigners meetings this semester. That gives you 10 meeting spots you can go ahead and schedule. And the best part of having Campaigners at a kid's house is you know at least one person will show up! *Ask parents to provide snacks in addition to the meeting spot. If you want to build momentum and community, plan a trip together. Maybe your group can't go to Summer Camp, but that shouldn't keep you from planning a weekend getaway in April. Consider doing a weekend mission project, serving somewhere together. When you're planning a trip, you have to talk details, get forms filled out, raise $, make decisions, etc... Often the leading up to the trip can be just as bonding as the trip itself. Plus, it gives you a good excuse to make Campaigners mandatory. "If you want to go on the snowboarding trip, you have to be at Campaigners tonight." High school coaches have figured out the value of allowing students to lead. They let kids vote on who gets to wear the 'C' on their letter jacket. Last year I didn't let my group vote, but I chose 2 guys in our group to be "Co-Campaigners-Captains." It was beautiful! I met with those two guys on Friday mornings. We prayed for the other guys in our group and I gave them the chance to lead their peers. It wasn't perfect, but it worked. I wasn't stuck texting everyone begging them to come to my thing. I called Parker & Zach, they then took charge and rallied the troops. One of the best ways to teach middle & highschoolers to become followers of Christ, is to give them a chance to lead. More thoughts on student leaders here. What other ways have you found to make Campaigners more successful?